Today is the referendum called by the Syriza Government in Greece. There will be demonstrations in support of a NO vote in many places including the UK. Many of the demonstrators are under the illusion that a NO vote “will be the start of the fightback against austerity” everywhere. In this brief position document the ICT reject this. The real fightback will only come through our own struggles and through our own self-activity. This is not the last word in what promises to be a long battle and we will have more to say in the coming weeks. Tsipras is in a corner. The Troika told him that if Greece’s debts were paid he could receive new funding, but only if he raised VAT (a tax on all consumers) and cut pensions. The Troika cannot afford to give in, especially to a government that claims to be from the "left", because if it did it would create a dangerous precedent for Italy, Portugal and in particular for Spain with the rise of the reformist party Podemos. Tsipras tried to negotiate the extension and reduction of Greece’s debt repayments but it was useless. So, not knowing what to do, he dreamed up a referendum to get the Greek working class to endorse his failure. 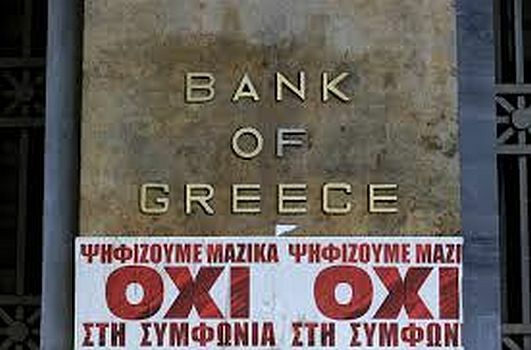 If the referendum delivers a YES to the economic and financial diktat of the EU, ECB and IMF (the so-called Troika) the list of sacrifices has already been drawn up. The Syriza Government is a capitalist government attempting to defend the national capital. It has already agreed to a new set of austerity measures even if they win the referendum. If Tsipras’ reformism fails it means he will probably have to resign, with the possibility that the fascist Golden Dawn, amongst other right wing authoritarian organisations (and a military coup is not ruled out), will raise their heads to offer a final "solution". However for workers there is no choice. Tsipras has boxed them into his own tight spot. A YES vote therefore means certain misery but to vote NO would not end austerity as Tsipras falsely claims. Instead it would throw Greece into an abyss of austerity in another form. Some tendencies inside SYRIZA argue that having their own currency is the solution. This is a reactionary fantasy … The possible exit from the euro would result in a devaluation of the drachma against the euro by 50-60%. Even if this did not happen the debt remains and it is in dollars so workers will soon find out just how much a defaulting state would have to pay. No European country would lend more money to Greece and nobody would buy bonds from Athens. In short, it would be a disaster. In addition, a devalued drachma might be theoretically helpful for exports, however, Greece does not have many, and it would be a tragedy for the cost of imports of gas, oil and raw materials in general, not to mention technological components. In addition, and for us this would be the worst thing, with the national currency devalued, so too would wages and pensions. Their purchasing power would fall dramatically. More misery heaped upon what has already been suffered. This would mean a rescheduling of debt and a less drastic policy of sacrifices, but nothing more. Even an indecisive vote would not open opportunities for the rescheduling of debts and a less drastic policy of sacrifices. Such a middle way would also be a capitalist solution. A third way, an entirely capitalist "solution", but projected onto the international imperialist backdrop, would be to sell themselves to the highest bidder: China (regarding the management of the port of Piraeus), or Russia over the Turkish pipe line that would replace the old Russian South Stream project. A few days ago the Russian and Greek governments signed an agreement to that effect. Perhaps this fact allowed Tsipras to dig in his heels against the Troika? It goes without saying that the exit of Greece from the eurozone would have negative repercussions for the European currency and the very future of the European Community. At the present time no-one wants this. Our initial conclusion is that we have to condemn Syriza’s promises of reform as either outright lies or simple illusions destined to collapse at the first contact with reality. We always argued that SYRIZA`s promise of reform is an illusion and doomed to failure. At the same time are also forced to put forward a political alternative to this capitalist debacle. We have to oppose its manoeuvres, its starvation policies, its savagery, and its proxy wars. In concrete terms, we must not fall into the referendum trap, because it proposes alternatives that are not alternatives. It is a farce designed to get the working class to identify with Syriza’s failed reformism. But the problem here is not about Greece, it is not even about Europe but about the failure of the global capitalist system. The only real reply to an insoluble capitalist crisis is the active resistance of the working class. And this does not mean in Greece alone but on an international scale. Austerity is everywhere and will not go away. In the short term this means opposing every trick and policy of the ruling class (including a pointless referendum) but in the long term it involves a creation from those struggles of an international proletarian party which can lead the global fight against a system which, as the Greek crisis demonstrates, offers only more misery for the entire world working class.